34. – 666.) 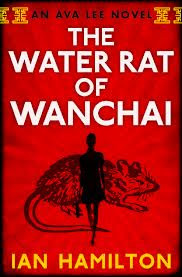 The Water Rat of Wanchai by Ian Hamilton – There is a new tough girl in Canada and she is an accountant – a forensic accountant to be exact. Ava Lee forsakes the genteel world of office accounting to join her “Uncle” Chow (an uncle by Chinese relationship rather than by blood) in the collection business. They specialize in collecting money for and from Chinese individuals residing around the world when all conventional methods have failed. Uncle and Ava work on a simple principle. They pay expenses and take 1/3 of what they recover. Ava is a salvage expert in the mould of McGee. Ava, like Travis, is a mixture of brains and muscle. While she is only 5’3” and 115 pounds her training in the Chinese martial art of bak mei makes her a formidable foe in a fight. (Bak mei was a martial art of which I had not heard before reading the book. It is aggressive and not suitable for sport as the moves are intended to cause serious injury.) I was reminded of Lisbeth Salander if she had been trained in a martial art. Considering Lisbeth’s personality it is best she remained untrained. They deal with the cases where fraud has been committed and the money has disappeared or placed beyond reach of traditional recovery. Ava’s accounting skills allow her to evaluate how the money was taken and trace where it has gone. Once found she seeks to persuade the fraudster to return the funds. If verbal persuasion should fail alternative methods will be undertaken. Ava lives happily in a luxury condo in an exclusive area of downtown Toronto on Bloor Street. She travels the world in her work. She has the largest passport Canada issues because of the number of entry stamps. She comes from an unusual relationship by Canadian standards. Her mother is her Chinese father’s second wife. He established a marital relationship with her while remaining married and living with his first wife. The second wife and children are recognized but do not have the same rights as the first wife and children. There is more character development than the average thriller. Uncle and Ava agree to seek the return of $5,000,000 which has been taken from businessman, Andrew Tam. He has been financing the purchase and sale of seafood when he is caught in a skilful scam. The investigation sees Ava traveling to Hong Kong, Thailand, Guyana and the British Virgin Islands. In her journeys outside Canada to distant locales I was reminded of Anthony Bidulka’s gay sleuth, Russell Quant, who leaves Saskatoon for faraway places in each mystery. Adding to the comparison Ava is a lesbian though, unlike Russell, her sexuality does not play a significant role in this mystery. I also thought of Jill Edmondson’s tough girl, Sasha Jackson, another female Toronto sleuth. Ava neither has Sasha’s biting tongue nor is she constantly swearing. The trip to Guyana is unlikely to encourage any reader to head to that South American country. Dysfunctional is too modest a term for the nation mired in poverty and violence. The reader is drawn swiftly along through the book. I completed it during an 8 hour flight from Europe to North America. What struck me in the end is that Ava, like McGee, while living by a strong moral code engages in amoral, even criminal acts, in her salvage operations. The book was a worthy winner of a 2012 Arthur Ellis Award for Best First Fiction. I probably would not have read the book without the award because of the title. A title should not sway me but a book with “rat” in the title does not appeal to me. Bill - Oh, this does sound like a different kind of sleuth and a different kind of thriller. I've heard of forensic accountants before but there aren't a whole lot of them in crime fiction and none quite like Ava Lee. I'm going to have to check this one out. Margot: Thanks for the comment. I am surprised there are not more crime fiction forensic accountants. They delve into the disappearance of money around the world. I knew a forenic accountant. He investigated real life mysteries. For a time he was hired to explore the handling of funds in the Caribbean.